Position the vehicle at the start of the test run. Place the brake meter on the level section of the vehicle floor. Line up the brake meter with the direction of travel. Set the lever with the arrow pointing to 'FREE'. Release the wing screws and set the scale to 'level'. For fine level adjustment retighten the wing screw on the knurled wheel wing screw side only and adjust by rotating the knurled wheel. On obtaining the ' LEVEL' position, finger tightens both wing screws. Drive vehicle at steady speed of not less than 32 Km per hour and apply brakes smoothly and progressively to bring the vehicle to a stop. Brakes must not be jabbed or snatched or an incorrect reading will be obtained. Record the test meter readings. Reset to zero and carry out same test for hand brake. Always check manufacturers guidelines for the correct test procedures as damage can result to various models. (ie. 4WD, foot applied type, Holden and Ford separate shoe type). Return the test lever to FREE POSITION and place meter in the meter box with these test procedure instructions. 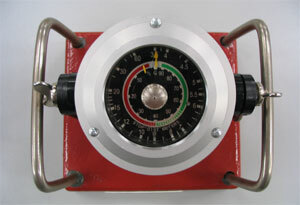 Brake meters consist of a light p~per scale, a low friction mechanism and an oil sealed damping box and although designed for use in workshop conditions, must be sent to an approved certifier for an annual test and calibration as per New Zealand Land Transport Safety Authority regulations.